Last week we officially launched XOMNI Cloud v3 and the response has been amazing! We wanted to share a few helpful links so you can get to know what this new release has to offer, starting with a Whitepaper authored by Microsoft. Super Search: Hyper performant search is key for any quality product catalog based in-venue and mobile experience. Of course, scalable search is just as important when dealing with Tier 1 retailers and their VERY deep product catalogs. XOMNI is ready for the largest of large catalogs out there today. Simple Experiences: A common misconception about Omnichannel is that it’s complicated. From Omnichannel implementation to the experiences themselves, they are user centric, integrated, immersive and by connection complicated. Not true. First, XOMNI makes integration with existing systems easy. Second, although XOMNI provides a seemingly endless list of features and supported scenarios, no one said you must use them all in one application! It’s true, endless aisle, associate experiences and what we call epicenter experiences can benefit by rich functionality. XOMNI powers many such experiences. However, we encourage the use of what we call Micro Experiences to engage customers in a meaningful but simplistic way. We are excited to announce new mechanisms as part of XOMNI Cloud v3 to attract customers and measure success. Expert Support: You don’t need to figure out the Micro and Immersive mix of experiences all by yourself! For this, we encourage engaging our Channel Partner ecosystem to selectively use XOMNI features that accomplish specific goals. We can’t wait to see how our customers and channel partners leverage the new functionalities shipped in v3. 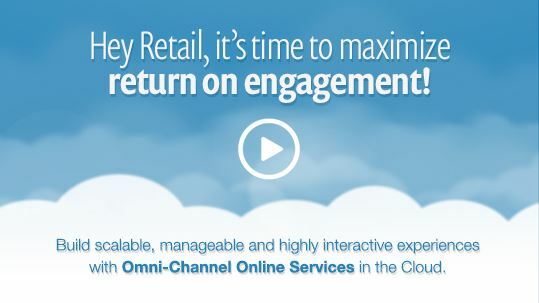 If you haven’t already, please follow xomni_cloud on twitter to share your success and keep up with the latest in Omnichannel innovation. This entry was posted in Announcements, Stories and tagged Channel Partner, Immersive, Micro Experiences, omni-channel, retail, Super Search, XOMNI Cloud v3 on March 10, 2015 by XOMNIAN. The XOMNI Release Engineering Team is happy to announce the immediate availability of the final release of XOMNI Cloud Platform V3, a major milestone. We are sure you’ll enjoy the many improvements. We’ve done our best to bring the latest technology to our platform while still maintaining the stability, performance and security that you’ve come to expect. Twitter Integration : When we first released our Facebook integration specifically crafted for retailers, our partner ecosystem fell in love with it. Engaging social scenarios + simplicity + innovative analytics makes adding social to your application a no-brainier. Now, we are extending the functionality to Twitter as well! Inventory Support : Today our partners implement inventory logic on our platform thanks to the flexibility of our APIs. Now, we have much more! As part of v3 we have build-in inventory support with extended functionality designed to enhance the customer experience. A powerful inventory API will make contextual scenarios where inventory data is required much more effective. UI Analytics : In our V2 API we released the back-end analytics integrated with loyalty data. With v3, we have UI analytics as well. Interactive agencies can now easily implement flexible scenarios to track much more including simple A/B testing. Is your pilot hitting your success metrics? You’ll now know. Combine this data with Audience Measurement and gain even greater insights. Public API SDK for .NET : Starting from V3 of our APIs you can build in-store experiences on top of our Public API SDK for .NET and not worry about straight API implementation at all. This has been one of the popular requests we received from our partners and very happy to ship it! Meaningful Open Sourcing: This is huge! Our hope is to open source EVERYTHING that takes a dependency on our APIs. Samples, Reference Applications and even our CMS! As of v3, we have all of our SDKs open sourced on GitHub! This means you can grab the source code, discover the inner workings and contribute. Make it your way! We will have much more to announce in time. NuGet Packages : Our developer experience team wanted to make it easier for you to start building your next back-end integration or the next amazing client experience you are envisioning. Now you can simply use our NuGet packages without worrying about API minor updates or SDK updates at all. This will streamline the update rollouts directly to your developers desktop. A dream come true for many of our partners and certainly and dream to use! 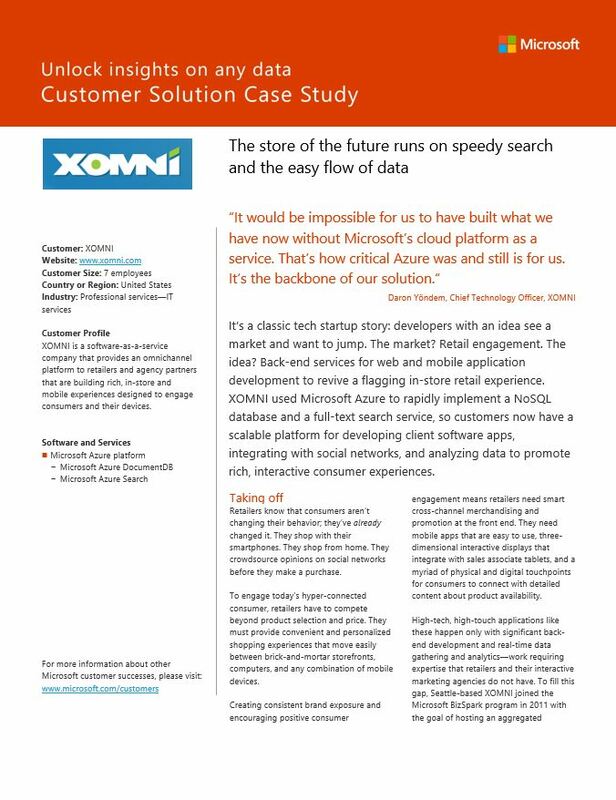 Azure Search : Search is a critical part of XOMNI. We were extremely happy to be invited to participate to a very early adoption program for Azure Search and work with Microsoft’s Azure Search Development Team. It’s not a coincidence that we have released our V3 APIs at the same time Microsoft released their Azure Search product and made it available globally just now! See Microsoft Blog for their announcement with a quote from our CTO, Daron Yöndem. Azure DocumentDB : We worked very closely with the Microsoft Azure team on their first document type NOSQL product. We got our hands on the program while they were building it and were able to provide very early feedback to make sure DocDB and XOMNI are a success together. We migrated our back-end analytics infrastructure to DocumentDB and built the all new client analytics on top of it. Check out the the interview our CTO, Daron Yöndem gave to InformationWeek about DocumentDB! I hope you find our resources on our developer portal to be useful, and thanks very much for all of our early adoption partners for their support on our journey. This entry was posted in Announcements, DevTeam on March 5, 2015 by XOMNIAN.